150 pages | 84 B/W Illus. 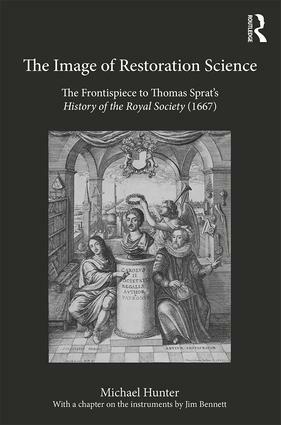 This book is about a single image - the frontispiece to Thomas Sprat’s History of the Royal-Society of London (1667). Designed by John Evelyn, and etched by Wenceslaus Hollar, it is arguably the best-known representation of seventeenth-century English science. The use of such plates to celebrate and legitimise the ‘new’ science of the period falls into a tradition that was well-established both in Britain and in Europe more generally, and which has increasingly attract attention from historians. Nevertheless, there are many questions to be asked about it and how it came into being. Was it an original composition by Evelyn, or is it based on earlier exemplars? Can all the scientific instruments, books and other objects that appear in it be identified, and what significance should be attached to their inclusion? Above all, how did the plate come to be designed in the first place, and what is its true relationship with Sprat’s book? In order to assess such issues, this study provides a full analysis of Evelyn’s image in its Royal Society setting and the wider world of early-modern science. The book first considers the overall iconography of the image and its message concerning Evelyn’s conception of the society’s role, before moving on to examine the myriad of details included in the plate and their significance. It concludes by considering the print’s history after publication, including the extent to which Evelyn used copies to exemplify the combination of technological and artistic accomplishment to which he believed the society should aspire. Michael Hunter, FBA, is Emeritus Professor of History in the Department of History, Classics and Archaeology at Birkbeck College, University of London. He is the author of numerous books, including Boyle: Between God and Science (2009); Boyle Studies: Aspects of the Life and Thought of Robert Boyle (1627-91) (2015) and The Boyle Papers: Understanding the Manuscripts of Robert Boyle (2007); and is editor of Printed Images in Early Modern Britain: Essays in Interpretation (2010).